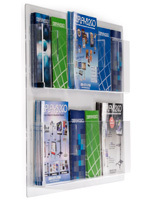 This mounted publication rack for an office makes pamphlets visible with clear acrylic facing. 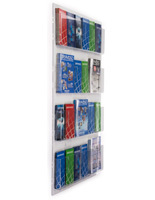 This display for office and retail dispenses all manner of newsletters, trifolds, or a blend of both, with (9) adjustable pockets. 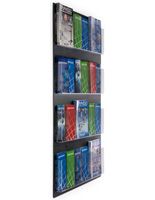 Each of these publication racks, such as literature stands, are must-have promotional tools for organizations with a waiting area or shop floor. 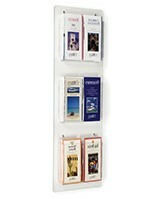 This magazine holder is also suitable for educational settings, museums, and hotel lobbies. 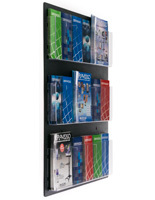 This publication rack that is an information display is a versatile store fixture. Hardware is shipped with this item for mounting to the wall. I ordered the brochure holder on January 18, 2019 and received it Friday, January 25. It is beautiful and perfect for our needs. It came with all the necessary hardware to hang it which made installing a breeze. I love that it is clear because then it isn't so obtrusive in its current location. 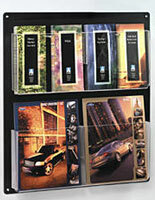 I also love that it has dividers that can change each slot to either a 8.5x11 or a brochure size. 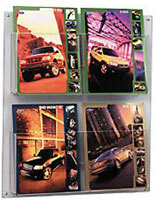 These dividers are sturdy and very easy to take in and out too. 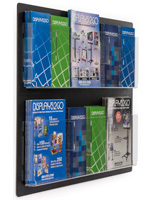 The entire display is very sturdy and not cheaply made.